When you read these words, how do you feel? These are all Uranian words, and all attributes of change. It’s been said many times that the one certain thing in this world is change. Change is possibly the most fundamental attribute of our lives. How does a business person respond to the inevitability of change and the fact that some changes are utterly unforeseeable? What does “built to last” really mean? Does it mean that we build a structure, an unchanging edifice for our businesses, and depend on it to always remain? Since denying, resisting, or avoiding change is ultimately futile, how then do we plan for, even welcome, the unpredictability of Uranian energy in our business strategies? In Business Management 101, we learn that our business success depends on anticipating and responding to change effectively. The forces of change can be external or internal. Some examples of external forces we are currently experiencing are recession, unemployment, the dominance of the internet, technological advances, government regulation, high cost of fuel oil, the global economy, and the proliferation of mega-stores, from Wal-Mart to the Starbucks opening down the street from your café. Internal changes can include changes in employee attitudes and behavior, the loss of a key employee, training and education, your changing personal situation, temporary or permanent lack of motivation and drive, and many other factors. What is the most effective way to work with change in our business? An interesting theory to explore according to astrological theory is the “force-field” theory of Kurt Lewin. It says that there is a constant interchange of driving forces and restraining forces. Driving forces may be new technologies, new materials, new competitors, while restraining forces may be group performance norms, fear of change, and complacency. An interesting thing about this theory is that an increase in driving forces causes a corresponding increase in restraining forces. In astrological symbolism, Saturn is the restraining force. As the furthest planet visible to the naked eye, for millions of years it represented for humanity the outer boundary of the known, the controllable, the foreseeable. It symbolizes the wall we erect between our current status and the outer forces of change. It serves to protect and preserve that which we have so carefully created. 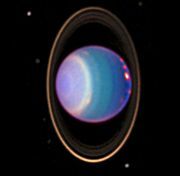 Uranus, on the other hand, was the first planet to be discovered after the telescope was developed and represents societal forces for innovation and progress. But what happens when these two titans are pitted against each other? According to the Lewin theory above, as one gets stronger the other will get stronger too. So the stronger the pressure to change, the stronger the resistance will be. In astrological theory, the outer planets, societal forces for change, will always eventually overwhelm the inner planets, our personal goals, desires, and resistances. The power of the outer planets is impersonal and has to do with the evolution of life on earth as a whole. People will change, technologies will change, global distribution systems will change, industrial methods will change, and the market will demand different products. The Lewin theory suggests that since driving forces activate their own restraining forces, the most effective way to handle change is to work to decrease restraining forces. But in astrological terms we never want to diminish the Saturn force of protection and preservation too much – it is the edifice we build to contain and actualize change. We must find the way to consciously open to the power of Uranus by easing, not diminishing, the power of Saturn. First of all, by understanding the inevitability of change. Secondly, welcoming, setting a place at the table for innovation. Building creative innovation into our business plans. Actively projecting the probable future during the business planning process. Staying aware of the trends and issues facing society and actively engaging with them. Making the unfamiliar, familiar through training. Appointing a change agent in our business, either our self or another, who takes the leadership role in anticipating and managing change. Actively seeking the counsel of our employees, especially younger and newer employees. Taking on a mentor from a younger generation. Adopting and maximizing new technologies. How do you stay open to the forces of change? What techniques do you use to welcome innovation? How have you successfully decreased your resistance to the new? Please share your tips in the comments below. This entry was posted on Thursday, September 3rd, 2009 and is filed under Saturn in Virgo, The Planets, Uranus in Pisces. You can follow any responses to this entry through RSS 2.0. You can leave a response, or trackback from your own site. I love your list of strategies for working with change. My resistance to change does exactly what Lewin suggests – gets stronger the more change looks inevitable. I go toward every change, every software upgrade, every new home, every anything different with the same predictable attitude: screaming and yelling and digging in my heels. How do I deal with my resistance? By knowing myself. And by doing it anyway. I know all my resistance is just fear — fear of failing, fear of being inconvenienced, fear of making a mistake or a wrong choice. So the first item in your list is tops for me. I also do a fair amount of projecting and keeping an eye on trends in my field. I find that really helpful in managing both fear of change and my fear of “getting old.” I keep a close eye on younger people in my field, cuz they’re the ones who are leading new roads through the outer changes. Your posts give me so much to think about. I think your comments are thought-provoking, too, and they show your willingness to change – a very Uranian trait! Thanks, and your comments always add to my understanding, too. Thanks for passing the word on about the blogathon, Ellen! I love this article. I don’t have my own business, but you offer lots of great tips for dealing with change that are applicable to everyone, not just the business person. Whether it’s in our work, in the neighborhoods we’ve called home, or the businesses we’ve become loyal to, we must expect change or face stagnation. Embracing new technology is a big one. It’s evolving so quickly that we can be left in the dust in no time. A great advantage? It keeps the brain young, always a good thing. Uranus will be in Aries for quite a while and it’s my intention to keep the collection updated. Sure don’t want it to get stagnant. I’d like to include this article in my first set of updates. Thank you, CJ. I’d be honored for you to include this post in your updates.